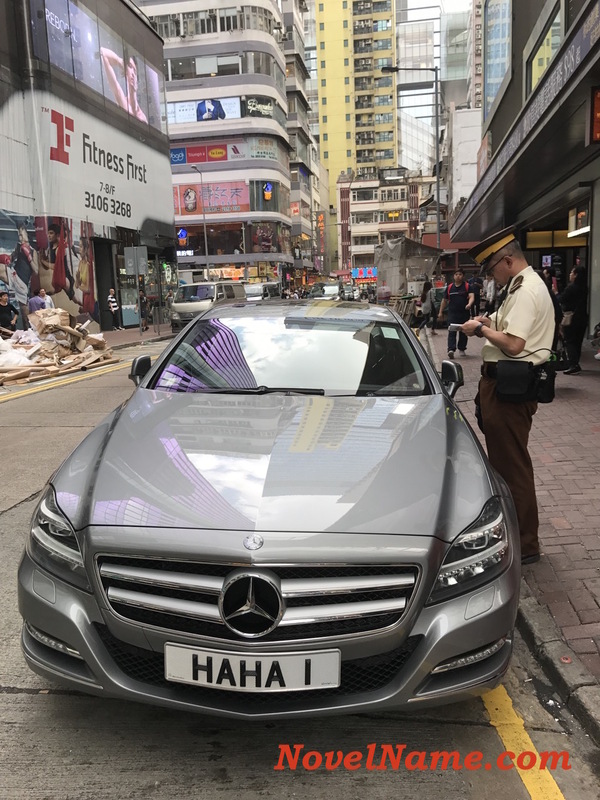 There were farcical scenes on the first day of Hong Kong's high-profile corruption trial involving a former government official Rafael Hui Si-yan. Following the current Hong Kong mentality, jury members cried off and complained ... which made High Court Justice Andrew Macrae discharge the entire jury and delay the start of the trial by another week. So the judge dismissed him from the jury. So the judge dismissed her and the entire jury, and sarcastically told the woman: "You can now go to Korea." All this took 90 minutes, which definitely cost far more than the cost of a little trip to South Korea. Have these jurors no shame? The most high-profile corruption trial Hong Kong has ever seen was today put on hold for one week after the nine-member jury was discharged. The adjournment came as two members of the jury, chosen on Monday, told the judge of reasons hindering them from sitting on the panel of nine people. It marks a delay in the case against former chief secretary Rafael Hui Si-yan, who allegedly received HK$34 million in cash and other inducements from the heads of Sun Hung Kai Properties (SHKP) – tycoon brothers Thomas and Raymond Kwok – and others. The law relating to the discharging of jurors is found in the Jury Ordinance. Section 25 provides that a court may at any time discharge a juror if it considers this to be in the interests of justice or the interests of the juror. Section 24 permits a nine member jury to be reduced to eight, seven, six, or five members in this way. If the jury has the full nine members, at least seven of them must agree on the verdict. No less than six jurors must agree on the verdict if the jury is reduced to eight members. Should the jury have less than eight members, at least five of them must agree on a verdict. The smallest jury possible under the Ordinance is one of five members. In such a case, they must all agree on the verdict. The issues with the jury began when a male juror said he was still in pain from double hernia surgery in March and that he needed to return to his one-man business operation. The jury was sent out of the courtroom for a discussion, then came back after some minutes. But then a businesswoman also raised a complaint, saying she planned to go to South Korea, but had to reschedule her flight at a cost. The jury was sent out again, and upon returning, the judge informed the remaining eight that their services would no longer be needed. “Thank you for your patience. All of you will have to be discharged,” they were told. Addressing the businesswoman directly, he added: “This means you can go to Korea," which prompted laughter in the courtroom. The judge also suggested that David Perry QC, for the prosecution, would now have time to take a trip before the trial resumes next Wednesday – a joking reference to Monday’s drama in which a number of prospective jurors refused to serve, citing summer travel arrangements to South Korea. The move was in response to concerns raised by some of the defendants’ legal counsel, one of whom said a verdict reached by a partial jury would not be convincing to the public, given the great public and political resonance of the case. Another legal representative expressed worry over the expected duration of the trial. Macrae had told the jury on Monday it could last until October, based on the original schedule. The Jury Ordinance requires five members, at the very least, in a jury. Hui, 66, faces eight charges related to bribery and misconduct in public office. Thomas Kwok Ping-kwong, 62, co-chairman of SHKP, faces one charge of conspiracy to offer an advantage to Hui and two counts of conspiracy to commit misconduct in public office. Raymond Kwok Ping-luen, 61, also co-chairman, faces four charges, including one count of furnishing false information with Hui. Thomas Chan Kui-yuen, executive director of SHKP, and former Hong Kong stock exchange official Francis Kwan Hung-sang each face two charges. The prosecution in the most high profile graft trial in Hong Kong's history was today put on hold after issues with the jury forced its dismissal. The city's former number two official and the co-chairmen of one of the world's major real estate firms are in the dock. Former chief secretary Rafael Hui Si-yan is accused of receiving HK$34 million in bribes and other financial inducements from billionaire brothers Thomas Kwok Ping-kwong and Raymond Kwok Ping-luen, the chairmen of Sun Hung Kai Properties (SHKP). 11.30am: The case has been adjourned. 11.20am: "Thank you for your patience. Your services will no longer be required," the judge tells the eight jury members. Addressing the woman with the flight booked, he adds: "You can now go to Korea." 11.15am: The panel of eight jurors are summoned back to the courtroom and they are all discharged, throwing the process into disarray. All are told to leave the court. 10.55am: Scenes in court are becoming farcical as another juror raises objections. She tells the judge she had changed the date of a flight to South Korea to serve on the jury, but now the travel agent wants to charge her for switching the flight. The eight remaining jurors are again sent out. 10.48am: After some discussions about the juror's medical condition and his working hours - the juror in question had earlier also mentioned he had to get to work after the trial had wrapped up for the day - the judge has dismissed him. It is unclear whether the case can now continue. 10.38am: Discussions over. The jury, consisting of four women and five men, is summoned back to the courtroom. The nine were chosen from a 150-strong pool of potential candidates, in a selection process on Monday that took around two hours. 10.18am: There's a delay to the opening as a juror tells the judge he is still in pain following a double-hernia operation in March. The entire jury is sent out of the courtroom while the matter is discussed. The discussions cannot be reported for legal reasons. Prosecutor David Perry QC arrives in court. Photo: SCMP 10.11am: The defendants, all dressed in suits and ties, sit in the glass-encased dock in two rows. In the front is Thomas Kwok, flanked by brother Raymond and Rafael Hui, while the co-defendants are seated behind. 10.04am: Mr Justice Andrew Macrae arrives at 10am on the dot. The nine-member jury files in a short time later, with the juror who fell sick yesterday, detaining the opening of the prosecution for half a day, back to good health. It will be a long slog for everyone involved, as the case is penned in to run possibly until October. 9.47am: Prosecutor David Perry QC enters the courtroom. 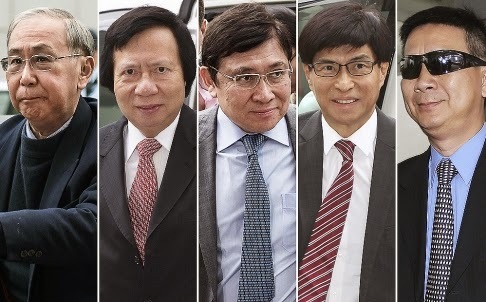 The prosecution is expected to open its case against the five defendants - brothers Raymond Kwok Ping-luen and Thomas Kwok Ping-kwong; Thomas Chan Kui-yuen, former chief secretary Rafael Hui Si-yan, and executive director of SHKP and former Hong Kong Stock Exchange official Francis Kwan Hung-sang - at 10am. Reporters and cameramen crowd around the doors of Hong Kong's High Court, ahead of proceedings. Photo: SCMP9.40am: With tempers finally calmed scores of reporters and members of the public file up to the fifth floor of the courthouse, as lawyers carrying bundles of documents enter the courtroom. Raymond Kwok stops in front of photographers to allow them to take pictures before entering the building. 9.30am: Good morning and welcome to the SCMP's live coverage of Hong Kong's biggest ever graft trial. Colourful scenes at the courthouse ahead of the opening of the prosecution, with journalists clamouring for spots in the High Court. Media outlets had started to queue for seats as early as 7pm Tuesday night. This morning tempers flared among journalists as one was caught trying to remove pre-registered names from the media seating plan. 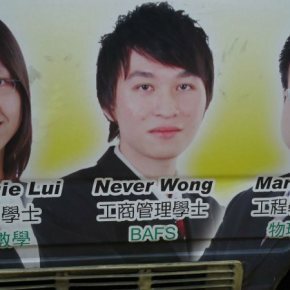 Hong Kong's biggest corruption case begins today, following the selection of the 9-panel jury. The case will focus on former chief secretary Rafael Hui Si-yan who is alleged to have received HK$34 million in cash and other inducements from the heads of Sun Hung Kai Properties (SHKP) and others. 1) Planned holidays, with one woman going to South Korea to meet "a handsome man" who acted in the well-known science fiction series My Love from the Star. Mr Justice Macrae joked: "It looks like the court will have to move to Korea." 2) Having to plan a funeral. 3) Caring for a newborn. 5) Attending the World Cup in Brazil. The city's most high-profile corruption case gets under way this afternoon and is likely to last for about four months after a jury was selected yesterday. Mr Justice Andrew Macrae told the jury the High Court trial - which involves what he called "relatively straightforward" issues - might run until October. That is two months over the original 70-day schedule. Nine jurors - four women and five men - will hear claims that former chief secretary Rafael Hui Si-yan received HK$34 million in cash and other inducements from the heads of Sun Hung Kai Properties (SHKP) and others. During the two-hour jury selection process, some among the 150-strong pool gave various reasons for why they were unsuitable to perform their public duty. Several said they had planned trips to South Korea, with one woman going there to meet "a handsome man" who acted in the science fiction series My Love from the Star. Mr Justice Macrae joked: "It looks like the court will have to move to Korea." And after one said he planned to go to Thailand, the judge replied: "There's a coup there." Other excuses included having to plan a funeral, caring for a newborn, going on honeymoon and attending the soccer World Cup in Brazil. The judge warned them they had to declare if they or close relatives had personal links to the defendants or people and firms related to the hearing. But those who had bought flats from SHKP would be eligible as long as they did not have legal disputes with the developer. Mr Justice Macrae told the pool that the court would excuse them only when there were "compelling reasons" to do so. "Inconvenience is not a sufficient reason to be excused," he said. "Without people's cooperation, the jury system, which we are lucky and are proud to have, cannot work properly and smoothly." He also warned the jurors not to conduct their own research, read related news or discuss the case with others on Facebook. He asked them to keep a "fresh, open mind" and to rely only on evidence they heard in the court. He said: "It is not necessary that the jury is completely ignorant as to the identity of the persons they are about to try. Otherwise, the famous could never be tried." He said the issues in the case were "relatively straightforward", though it did not mean evidence would not be complex. Thomas Kwok Ping-kwong, 62, co-chairman of SHKP, faces one charge of conspiracy to offer an advantage to Hui and two counts of conspiracy to commit misconduct in public office. Raymond Kwok Ping-luen, 61, also co-chairman, faces four charges, including one count of furnishing false information with Hui. Thomas Chan Kui-yuen, executive director of SHKP, and former Hong Kong stock exchange official Francis Kwan Hung-sang each face two charges. All plead not guilty. Name Category: Creation; Nature based; Phonetic based? Owners who look like their pets. Why is this? The short answer is Familiarity (according to psychologists). The "dog whisperer" (story below) talks a lot of sense. Pet owners should understand that looking after pets is similar to looking after two-year old kids. As a celebrated "dog whisperer", Cesar Millan knows a thing or two about animal behaviour. But often it's the owner he needs to teach. 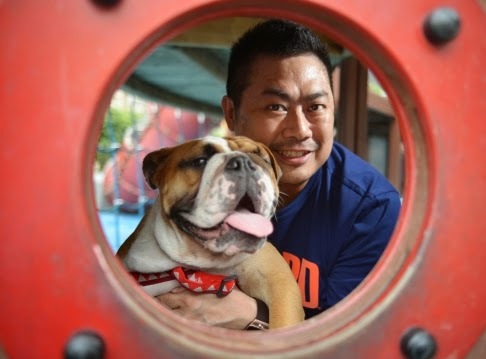 According to him, Hongkongers who say dogs are too much of a handful for their hectic lifestyles are only making excuses. "[Saying] 'I'm busy or it's hectic' - it's just an excuse to not be there for someone," Millan told hundreds of dog-lovers at Stanley Plaza yesterday. The 44-year-old dog trainer to the stars is in town to promote and film two episodes of his reality TV show. He will also perform at the AsiaWorld-Expo tonight. Between 2010 and 2012, almost 20,000 abandoned and wild dogs were put down in Hong Kong, with many others left in kennels and shelters. But Millan denied that the city's pace and lack of space made it unsuitable for dogs. Isabelle Ho with Molly. Photo: Antony Dickson"Someone who abandons their dog is likely to abandon their families as well. The difference is, the family can drive away, but the dog can't. It's left there." 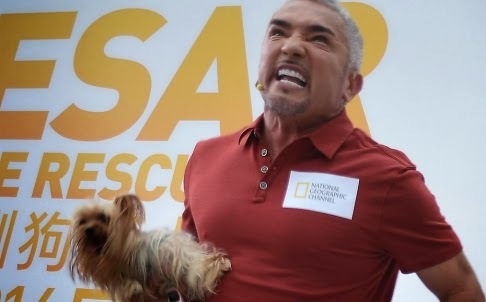 Owner responsibility is a strong theme in his reality TV shows Dog Whisperer and Cesar to the Rescue. But owners need to be more than just responsible. Balanced dogs, Millan says, require strong 'pack leadership' from owners, in the form of exercise, discipline and affection. Most people give too much affection, and not enough exercise and discipline. "My clients went to Harvard, but they don't know how to walk a Chihuahua. 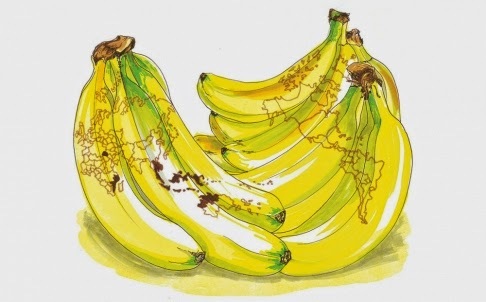 They're smart, but they don't understand nature." He pointed to a teenage girl who was clutching her terrier protectively as it was introduced to a bulldog several times its size. "See what she did there?" he asked, as the terrier yapped. The terrier would not naturally be afraid of the larger dog, but it had become aggressive after picking up on its owner's fear, he said. "The dog acts that way because they want to protect the human, because the human is scared." He picked up another dog which had become alarmed by the crowd. "The best thing to do is give him a massage. Don't let him hold the experience. Change the experience." Millan's demeanour calmed the dog instantly. One fan, Jack Hoi, 58, a retired civil servant, admitted to having "some problems at home" with his mini-pinscher, Mickey. Hoi said he watched Millan's YouTube show every night. "I love his philosophy on how to teach the owner," he said. 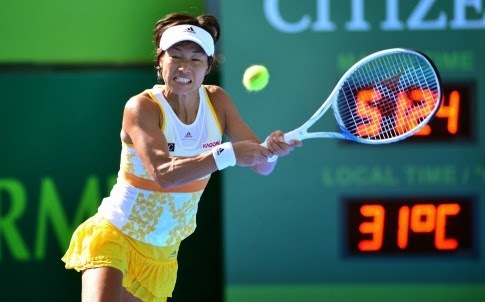 Is she Hong Kong's Venus Williams? Carter Ma Guowei (Mr), shoe designer, 27, from Guangzhou who has collected 500 rolls of rare film from all over the world in the past two years, including the first China-made film and a 126-year-old roll of Kodak film. There will be a film photography exhibition that will run until 20 May 2012 in Studio Kim Tak, Jordan, Hong Kong.